Luna Park is famous about town for its thrills, fun and excitement. However, few who enjoy its spectacle are aware of its rich and beautiful history stretching back over 100 years. We take you on a journey back in time to discover how Luna Park came to be the shining Melbourne gem it is today. It all started on December 13th, 1912, when Luna Park opened its doors to its very first visitors. Over 22,000 people passed through the mouth of Mr. Moon on that summer’s day, many of them rushing to try out the new Great Scenic Railway which still provides epic views over the city and the bay today. The Railway was operated throughout World War I that same decade, although the rest of the park cut back. Shortly after the end of the War, the park reopened with a grand celebration. New, fantastic attractions opened up including the Whip, Noah’s Ark, the Big Dipper and of course, the stunningly beautiful Carousel. Covered in 6,000 bright lights, the Carousel is a perfect representation of the beauty and magic that can be found in every corner of the park. On the date of Luna Park’s 25th birthday, the Carousel got a makeover of sorts, being dressed as an oversized birthday cake topped off by 25 giant birthday candles. This structure (minus the candles) remains as part of the Carousel today, which was classified by the National Trust in 1981. After restoration work in the early 2000s, the Carousel stands strong as a park favourite and a reminder of humble beginnings, and resilience throughout two World Wars. Also given the heritage treatment in 1981 was the Great Scenic Railway and the Face and Towers, followed by the spooky Ghost Train in 1989. The towering, white Scenic Railway was itself restored back to its former glory in 2008, shortly after the whole park was named as the National Trust Victorian Heritage Icon for 2007. These honours reflect the work that has gone into keeping the park by a passionate hometown and also helps tell a story about the warmth and nostalgia that fills the hearts of those who have made memories on its grounds. Today, Luna Park is just as beautiful and popular as ever. Gorgeous, dreamy artworks by Mark Ogge and Pamela Irving feature on the Great Scenic Railway platform and Luna Palace façade respectively, complementing the classic beauty of the Carousel. Mighty celebrations were had in 2012 to mark the park’s 100th birthday, done in the same hearty fashion as always. It brought back memories of a night in 1987, where party-goers dressed up in 1912 costume to mark the park’s 75 years, or of the revelry that came with Queen Elizabeth when she visited in 1954. These memories are ones that continue to be built upon. The park is now home to 14 rides, suitable for the kids and the thrill seekers (or both). In a testament to the way that it has become a place not only for playing, but for meeting and enjoying the company of loved ones, Luna Park is now also a unique choice of event venue with two new function spaces having opened in the last couple of years. 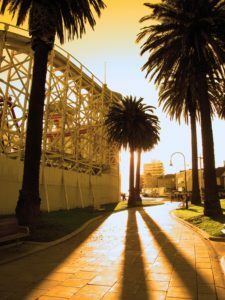 Steeped in history, art and beauty, Luna Park is a family destination like no other in Melbourne. Its constant accolades and heritage classifications are a clear indication of its cultural importance to St Kilda and why it continues to be loved by generation after generation. 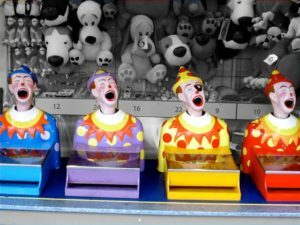 Luna Park is a Melbourne attraction not to be missed. 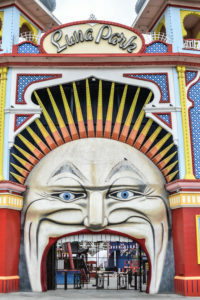 For more information on the wealth of attractions beyond Mr. Moon’s giant mouth, visit the Luna Park website.